Specialty Television Channel Web Site :: INHOUSE Productions Ltd.
INHOUSE Productions Ltd. is a collaborative design and digital production company based in Toronto, consisting of designers, copywriters, marketing specialists and online content developers with clients world-wide. 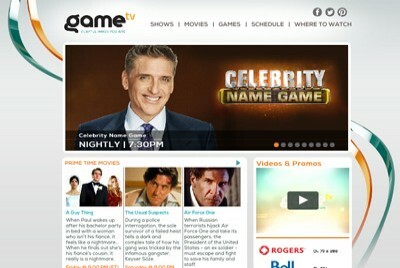 INHOUSE was tasked to redesign and redevelop the GameTV specialty television channel web site. The newly-developed site is based on a fully-customized CMS platform to allow for the management of all content from within a single access easy-to-use interface. Content management includes: weekly feature banners, individual programme listings with thumbnail images and descriptions, promotional banners throughout the site as well as business pages content. The existing site management required a mix of traditional ftp upload of image content, manual editing of xml files for handling banners and hyperlinks to programme content as well as single week scheduling which required twice-weekly updating. Further development has included a revamped marketing enewsletter format with improved content formatting as well as a robust sales microsite with customized marketing content and landing pages for specific marketing initiatives. Development completed in November 2014. Copyright © 2019 INHOUSE Productions Ltd.